Do you want to see “Frozen” world in this Winter season? As everyone knows, Gangwon is a heavenly place in Winter season along with massive amount of snow and ice giving a big thrill to visitors! In Gangwon province, we have top 3 icefishing festivals in Winter season. 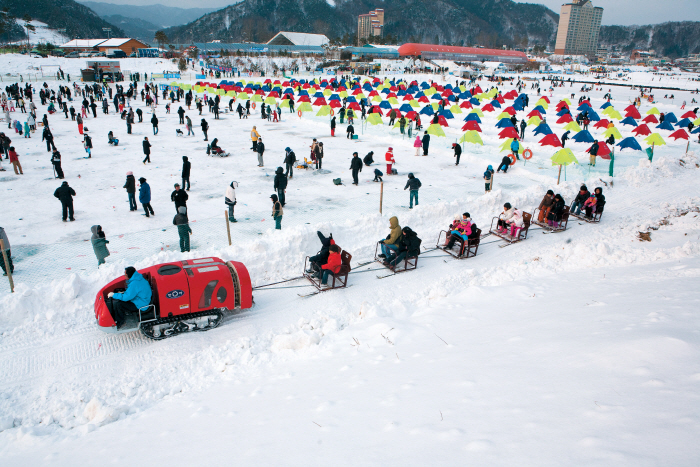 Hwacheon icefishing festival, Pyeongchang trout festival and Inje Bingeo Festival! 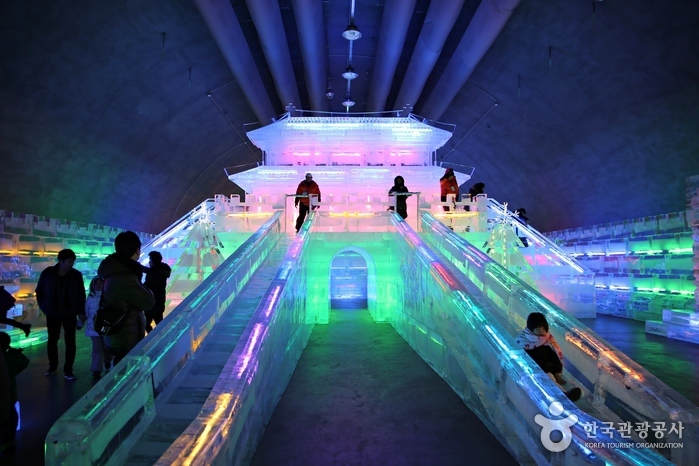 In these festival, you really can grab a fish from icy river with your bare hands, see the icy sculptures and play exiting games such as human bowling on ice, ice soccer and others. Visitors can try out ice fishing, and those who are feeling brave can try to catch mountain trout with their bare hands in this festival. At this spectacular winter festival visitors will be able to try out ice fishing and exciting games such as human bowling on ice, ice soccer, and even a tug-of-war on ice. 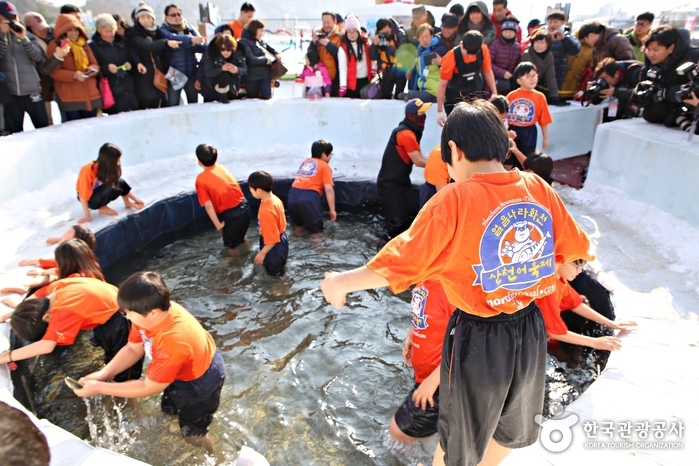 Pyeongchang Trout Festival takes place during winter season and visitors to the festival can enjoy the various programs like ice trout fishing and snow games. ► Main programs : Ice fishing / Snow programs etc. The Daegwallyeong Snow Festival is held in the Hoenggye-ri area, which is located in Daegwanryeong-myeon, Pyeongchang-gun, Gangwon-do. The festival starts with a fireworks display, followed by various programs such as a singing contest, an international naked marathon contest, a singing contest for multicultural families, a climbing competition, snow art contests, a snow literature event, etc. ► Main programs : Snow sculpture contest/Sledding/Bobsleigh-riding etc. Frolic in the fantastic world of white snow at Taebaesan Mountain! 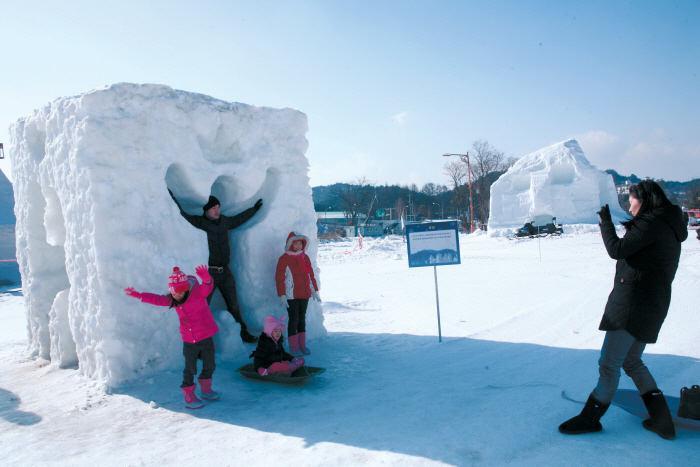 Danggol Square of Taebaeksan Provincial Park, the festival’s main venue, will hold a snow sculpture exhibition for visitors to enjoy ice sculptures and a range of other winter-themed artwork from home and abroad. There will also be a wide variety of amusement facilities such as a snow tunnel, slide and rafting area as well as snow and ice sculptures. Around Hwangji Pond, visitors may enjoy the light & ice festival along with the beautiful world of lights created by luminaries and the shining stars in the sky. Wait, are you worried of “how to go there?”. Please find information about GoGo Gangwon Shuttle Bus service that you can visit all the festival spot with 5,000 KRW 🙂 If you are a participant with Discover Korea Your Way Campaign, you can even have a FREE riding coupon! Details about Discover Korea Your Way Q4 campaign Click HERE. Come grab a rumble fish and enjoy your lively moment of Gangwon!